Providing professional level engineering, driver coaching and preoaration for Formula and Sports Racing cars. EFM Racing is on Facebook! Awesome 2014 NASA National Championships Video! Be sure to check out this AMAZING video from Leland "Insta" Graham! A fantastic work depicting the 2014 NASA National Championships weekend with our K2C driver Tazio Ottis and the whole EFM Team. Thanks Leland - it's great! Some cool video below of our graduate driver, TJ Fischer during a test at Buttonwillow Raceway Park! Click and enjoy! In support of JDC Motorsports, Eric Purcell of EFM Racing and Purcell Race Engineering had the opportunity to work with two great young drivers at this year's Chris Griffiths Mazda Road to Indy test at the famed Indianapolis Raceway on the GP course. 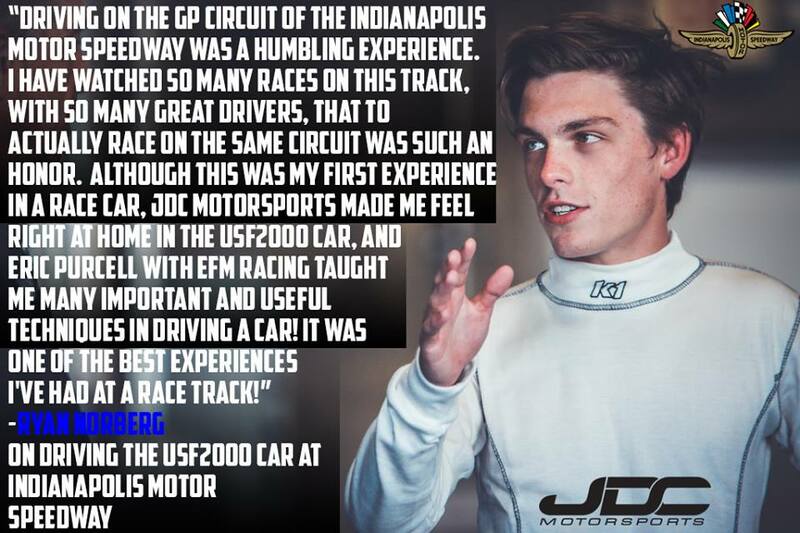 Dev Gore and Ryan Norberg were selected as the Mazda Road to Indy driver advancement program winners, and the prize was this two day test in JDC Motorsport's USF2000 cars. The same cars that have won USF2000 Championships and were most recently piloted by EFM Racing driver Tazio Ottis in the 2016 USF2000 series. Dev and Ryan, while both accomplished kart racers, had very limited experience in race cars. As a matter of fact, Ryan had never driven a race car before! Both drivers truly impressed during the test, and Eric Purcell noted "It was truly an honor and privilege to work with two such talented, dedicated young drivers so early in their career. It was a real treat, and they made incredible progress in just the two days". Ryan posted the photo below to the JDC Motorsports Facebook page, and we can't thank him enough for the kind words.